Looking for an amazing adventure but you don’t have enough vacation days? I feel your pain. 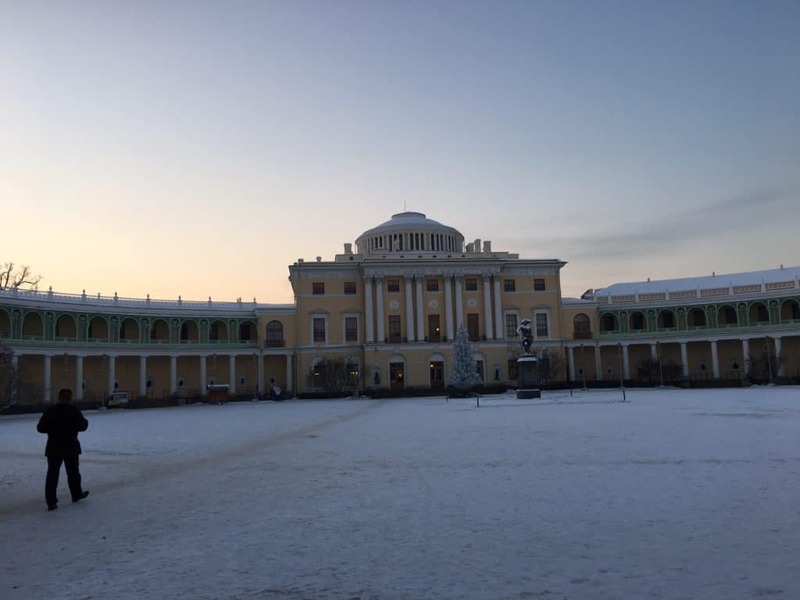 In this post, I will tell you about the Scandinavian / Baltic sea Cruise I took that allowed me to see St. Petersburg, Helsinki, Stockholm and Tallinn just in 5 days. A few years ago, my 3 friends and I decided to go on a trip together in the middle of December and the Baltic sea cruise seemed like a great option. It was currently on sale because not many people wanted to travel in the middle of December when it was already cold there and besides, it was just before the Christmas holidays, so people were sparing vacation days to go somewhere on a Christmas break. Well, we all were at the university back them, so it wasn’t a problem for us. In the end, we only had to skip 2,5 days of studying and that wasn’t critical at all. 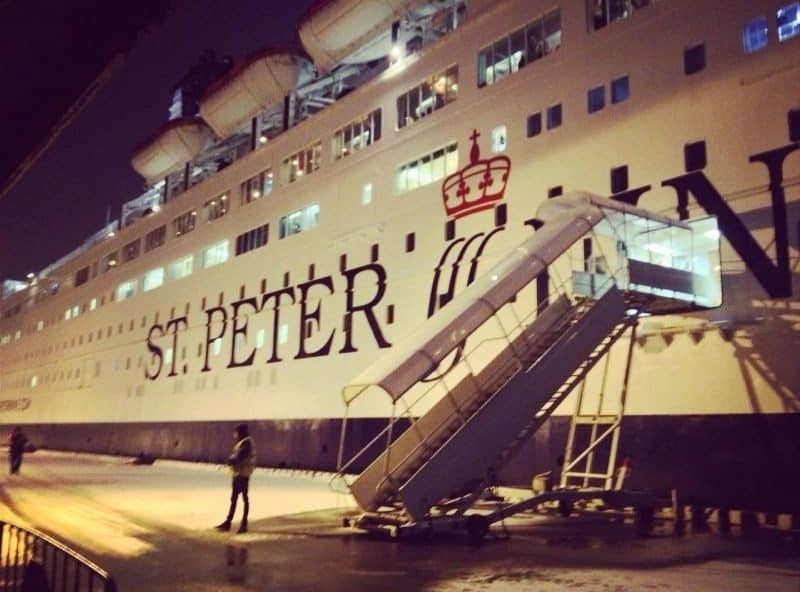 We bought a cruise from St. Peter Line and it was a great investment! What to expect from the Baltic Sea cruise? Since we all were based in St. Petersburg, Russia back then, our starting point was St. Petersburg. That cruise we took, Princess Anastasia, goes in circles pretty much non stop starting in St. Petersburg, continuing in Helsinki, then heading to Stockholm, Tallinn and then returning to St. Petersburg. So it works the same way if you, for example, depart from Stockholm, Sweden you will return to Stockholm, Sweden on the fifth day of the cruise. We started our cruise in St. Petersburg, but just because we lived there back then. I won’t write much about St. Petersburg here, but it’s worth mentioning, that you don’t need a visa to Russia, if you’re a cruise passenger and are there for just a day, so it’s a great way of visiting Russia without a visa. Another way of visiting Russia without a visa is going to the World Cup in 2018 in Russia, but it’s a whole different story. St. Petersburg is a massive city, but it’s also extremely beautiful. 1 day (or 7-8 hours) are terribly not enough in St. Petersburg, but it’s okay to get an overall impression of the city and understand if you want to come back there for a longer holiday. What can you do in 8 hours in St. Petersburg? 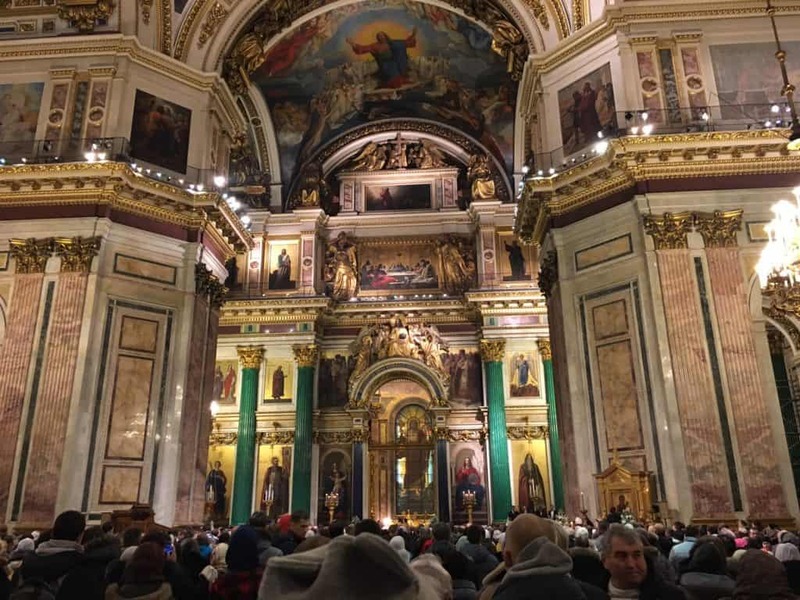 Well, take an Uber to the city centre, visit the Church on the Spilled Blood, Kazan Cathedral, take some photos in front of the Hermitage museum, eat some traditional Russian pies in Pirogovy Dvorik, climb to the top of Isaac’s Cathedral to see the panorama of the city and… head back to the cruise ship. Helsinki isn’t a world-famous city because, to be honest, it’s lovely and pretty, but there are not many landmarks worth visiting. I visited Helsinki 3 or 4 times and spent there 5-6 days in total. We only had about seven or eight hours in the city is and it was quite cold there, to be honest, around -10 or -15° Celsius. Thus, it wasn’t very pleasurable to walk outside at all. I’ll write a separate the guide about a Helsinki, Finland in one of my next posts. I think that one day is slightly not enough for Helsinki, but spending two days there would be great! 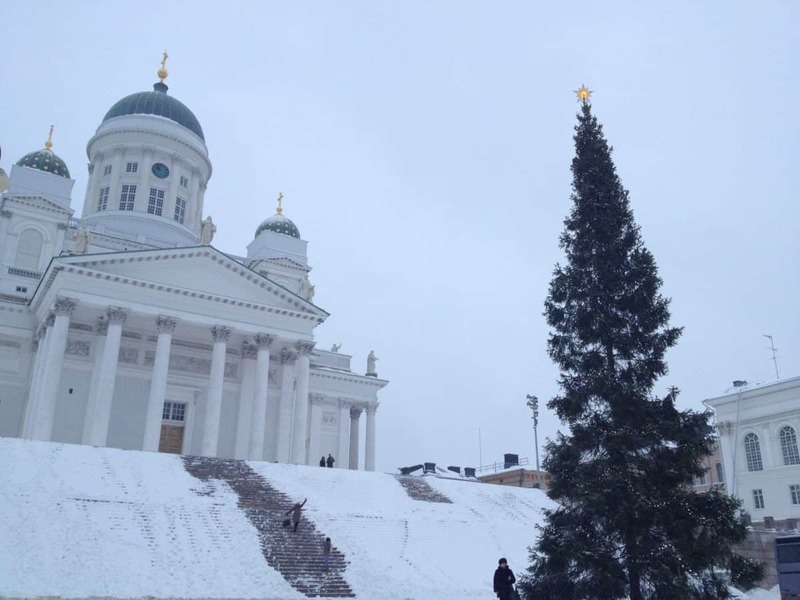 I also need to mention that Helsinki is very lovely decorated for Christmas and it also has a small Christmas market at the main square of the city in front of the famous cathedral you’re probably seen all the postcards from Helsinki. The Christmas market surprised me in a sense that every single tiny booth had a card reader so it was possible to pay by card at the Christmas market in all these tiny stalls! And that just proves the fact that Finland is one of the most innovative and technologically advanced countries in the entire world. Actually, if you walk around the city, you will see that technology is everywhere in Finland. And that’s awesome. Moreover, Finland is quite expensive. In case you want to eat outside in a restaurant, be prepared to spend 15-18 euros per dish and at least 6 euros for a glass of beer. After returning back on board from cold Helsinki, we went to explore the ship. I just admit that is was very impressive: around eight floors, multiple shops, restaurants and even a Karaoke bar! There was also a shisha lounge and a nightclub. So the ship is already pretty interesting by itself. The only problem – the internet on board was VERY expensive, so prepare to have an internet detox for a while. On the next day, we disembarked the ship and went to discover the capital of Sweden, beautiful Stockholm. To be honest, I didn’t have many expectations from Stockholm but I was surprised how beautiful the city is.. Actually, it looks a bit similar to St. Petersburg, Russia, my hometown, but it’s way older and it’s in Scandinavia, which means the culture and the values are completely different. We only had eight hours in Stockholm, just like in Helsinki however, unlike Helsinki I felt like eight hours were terribly not enough in Stockholm. You will probably need at least three days to discover the city because there’s so much to do and so much to see! Moreover, the city is quite big, so you need to take the metro everywhere. 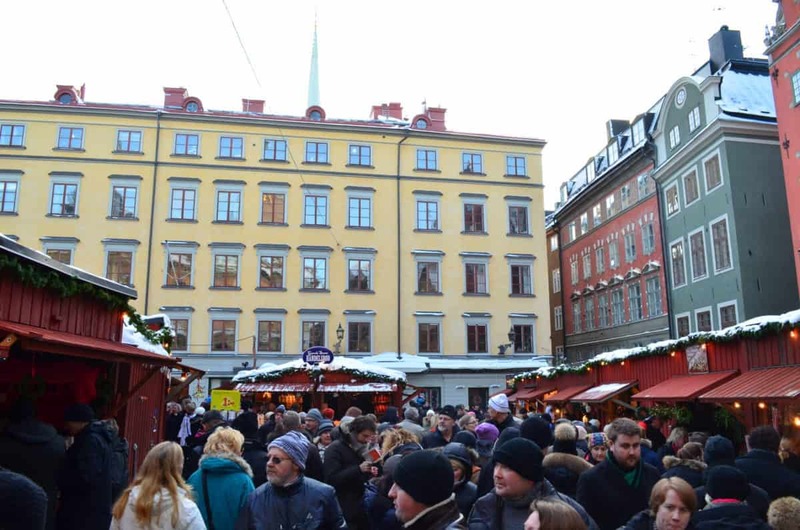 I loved the Christmas Market in Sweden – it was absolutely adorable, however, it was also super crowded! I barely could walk there and because of so many people, all the photos looked terrible. 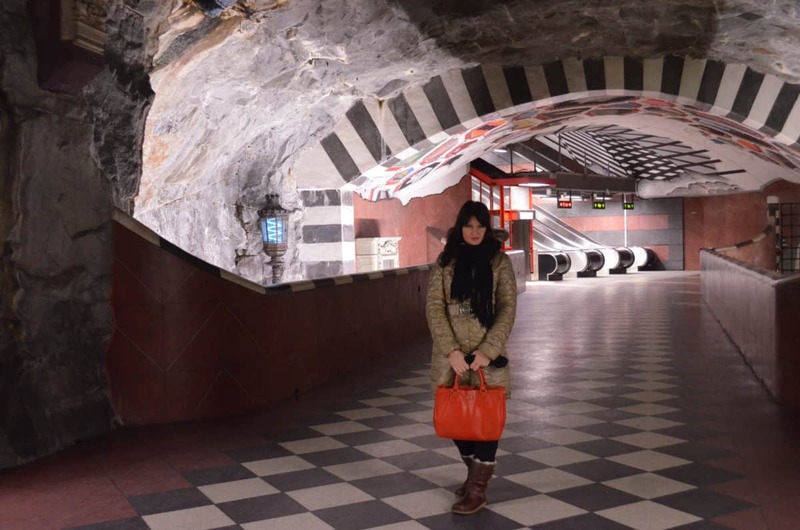 Another highlight of Stockholm was the metro. Some say that the most beautiful metro in the world is in Russia, however, I would say that I was way more impressed by the metro in Sweden. Yes, it’s not all made of marble and doesn’t look like a hall of a lavish palace like in Russia, but it’s very interesting and unique and every station has a unique idea behind it. I must add that Stockholm is really expensive, even more expensive than Helsinki (that was already expensive especially if you don’t like paying like €7 for a beer, but it still can’t beat that Stockholm, where we were only able to eat a McDonald’s as we were poor students back then). Nothing compared to Norway, of course, but still very expensive. I haven’t even tried the famous Swedish meatballs anywhere in Sweden, to see if they are actually tastier than in IKEA, so it’s a pity. I really want to come back to Stockholm and hopefully this November I will go there again to discover all the landmarks in the city. On the fourth day of the cruise, we were about to explore the capital of Estonia a tiny medieval city called Tallinn. It was actually my first time in Tallinn, but since then I returned there three more times. Since the city is really small, I already feel like an expert there. Estonia is used to be a part of the Soviet Union. It means that even though it’s a Baltic country, it’s still different from Sweden and from Finland in the sense that half of the people speak Russian and the prices are way cheaper than in Finland or Sweden. A pasta in Vapiano would cost you 5-7 euros, for example. However, the restaurants in the Old Town like e.g. Olde Hansa are very expensive. 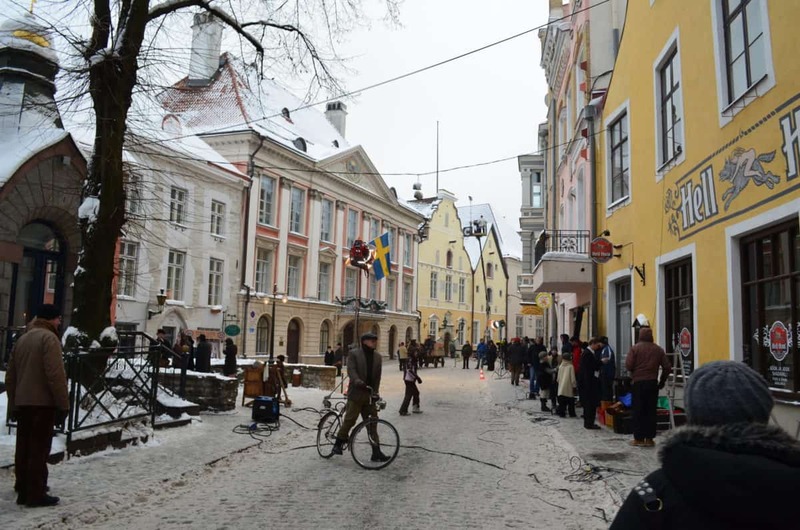 Tallinn looks amazing when the Christmas market is there. I also visited it in September and October, but nothing compares to Tallinn in December. The day I was there it was -17 and I was freezing! It was crazy to be all day outside, so I had to visit different shops from time to time to get warm again. In Tallinn, it’s just nice to visit the old town, climb the city wall and have a traditional lunch in one of the restaurants in the city centre. To summarise, the Baltic Sea cruise is a unique opportunity to explore 4 completely different countries at once: Russia, Finland, Sweden and Estonia. You won’t see that much of all these countries, but it’s enough to get an overall impression and decide, whether you want to come back to these locations or not. I didn’t take many cruises in my life, so I have nothing to compare, but in my opinion, this cruise ship was amazing and had so many things to do, so it’s definitely not boring. Looking for more information on this region? Check out our post about a mini-road trip around Belarus (no visa needed), Latvia and Lithuania! Liked this post about the Scandinavian – Baltic sea cruise? Share it on Social Media! Russian visa policy in 2019 or how to visit Russia without a visa? Trips with friends are always the best! Great post! The photo you posted from Helsinki was absolutely beautiful. It looks like a winter wonderland! I keep considering a European cruise, and it’s great to see some practical feedback on one of the options. Thanks for the peek inside! Tallin in Estonia seems like a very quaint town. I should hope to visit it one day. Thanks for the article. You won’t believe this, but my parents did this exact cruise this summer! I was so jealous and absolutely gutted I couldn’t join them. Their photos are gorgeous (though I think yours are slightly better, haha!) and it brings home that I really haven’t explored as much of northern Europe as I’d like. Thanks for the reminder I need to brave the cold and explore my own continent a little more! Also, just read your About section and your story is just adorable! As fellow expat and someone who knows the pains of long distance (in the nine years my boyfriend and I have been together, I think we’ve been LD for two or three of them in total, including now), I just want to say thanks for sharing your story! Love knows no borders! I would have never thought of doing a cruise in winter, especially to the Northern Countries. It looks like you had a lot of fun and experienced different types of cities. I have only been to Stockholm and I do remember how expensive it was. I did rely on McDonald’s as well quite a lot, haha. I’m not a huge fan of sea cruise but it’s a good option to see many places just in few days especially as you said… when you don’t have enough vacation days ! I would love to see St Petersburg & Stockholm in winter time 🙂 Maybe next year ? Thank you for sharing your travel experience ! Your post includes really useful and informative tips. This seems like the perfect itinerary. I’ve always wanted to visit Scandinavian countries and being a cruise lover, this seems perfect.